A Seattle Cosmic favourite. One of the GamesWePlay. 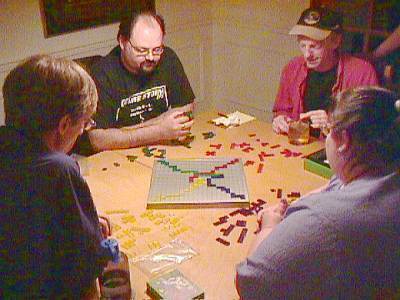 In Blokus, players attempt to place all of the polyominoes of their colour on the board, while blocking other players from doing so. Each successive polyomino you place must touch at least one of your other polyominoes, but only at a corner. (This makes for some interesting tactics as players attempt to snake their pieces past their opponents' pieces.) Score is dependent on how many squares are left in the pieces you couldn't fit onto the board, with modifiers; for example, if you have one pentomino (five squares) and one tetromino (four squares) left, your base score is -9.